(CBS/AP) SOFIA, Bulgaria - A bus carrying Israeli youth exploded Wednesday in a Bulgarian resort, killing at least six people and wounding more than 32, the Bulgarian Foreign Ministry said. Israeli Prime Minister Benjamin Netanyahu called it "an Iranian terror attack" and promised a tough response. The explosion took place in the Black Sea city of Burgas, some 400 kilometers (250 miles) east of the capital, Sofia. TV images showed smoke billowing from the scene -- a parking lot at the local airport, where the Israeli tourists had apparently just landed. Several buses and cars were on fire near the shell of the exploded vehicle. Israeli Foreign Minister Avigdor Lieberman, after being briefed by his Bulgarian counterpart, said the explosion was caused by a bomb placed on the bus. He said seven people died, but by Wednesday night the Bulgarian Foreign Ministry had placed the death toll at six and the number of wounded at 32 people. No group immediately claimed responsibility. But Israelis often have been targeted in attacks outside their country, and Wednesday's bombing coincided with the 18th anniversary of the bombing of a Jewish community center in Argentina that killed 85 people. Israel suspects Iran of being behind several of those assaults, which have added to the tensions between the two nations already exacerbated by Israeli warnings against Iran's alleged pursuit of a nuclear weapons program. Israeli Defense Minister Ehud Barak said the blast was "clearly a terrorist attack initiated probably by Hezbollah, Hamas, Islamic Jihad or another group under the terror auspices of either Iran or other radical Islamic groups." "We are in a continual fight against them," he said in a statement. "We are determined to identify who sent them, who perpetrated [the attack], and to settle the account." Netanyahu noted that Wednesday's attack followed similar attacks or attempted attacks in India, Georgia, Thailand and Kenya and Cyprus in recent months. He said that once again, "all signs point to Iran," though he did not offer any evidence to back up the claim. "This is a global Iranian terror onslaught and Israel will react firmly to it," Netanyahu said. Tehran did not immediately issue any comment. Bulgarian Prime Minister Boyko Borissov said he and Netanyahu agreed to work together in investigating the attack. President Barack Obama condemned the "barbaric" attack and vowed to stand by the people of Bulgaria and Israel. "These attacks against innocent civilians, including children, are completely outrageous," the White House said in a statement. "The United States will stand with our allies, and provide whatever assistance is necessary to identify and bring to justice the perpetrators of this attack." Israeli Foreign Ministry spokesman Jonathan Rosenzweig said a flight from Tel Aviv had landed at 4:45 p.m. at the airport and that the blast took place about 40 minutes later. The tourists were apparently boarding the buses to go to their hotels. Lieberman said the bus was transporting tourists who had arrived in a charter flight from Israel. There were 154 people on the flight. Witness Gal Malka told Israel's Channel 2 TV that she saw someone board the bus before it exploded. Malka, who was lightly wounded, said the bus was full of Israeli teenagers. "We were at the entrance of the bus and in a few seconds we heard a huge boom," she said. Witnesses told CBS News reporter Jordan Jordanovich that flames were five meters high. 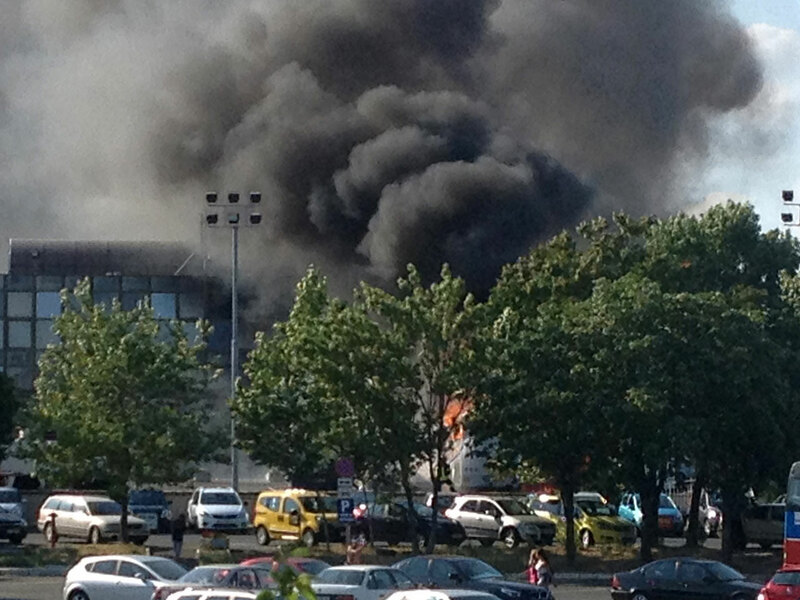 The Burgas airport was closed and traffic redirected. In Sofia, meanwhile, Mayor Yordanka Fandakova ordered a stronger police presence at all public places linked to the Jewish community. There are some 5,000 Jews in Bulgaria and most live in the capital. Iran, which insists its nuclear program is peaceful, has in the past accused Israel of being behind deadly attacks on Iranian nuclear scientists. Israel has not admitted a role in those strikes, but it and others have accused Iran of alleged reprisal missions, including a February bombing in New Delhi that wounded an Israeli diplomat's wife and the discovery of a cache of explosives in Bangkok that Thai officials claim was linked to a plot to target Israeli diplomats. Iran has denied involvement. In Azerbaijan's capital, Baku, security officials in March announced the arrest of 22 suspects allegedly hired by Iran for terrorist attacks against the U.S. and Israeli embassies and other Western-linked sites. Israeli officials also have long feared that the Iranian-backed Hezbollah guerrilla group would try to attack Israelis abroad. Hezbollah has accused Israel of assassinating a top leader in Damascus in 2008 and vowed to avenge the killing. Israel has never admitted involvement in the mysterious explosion. Deputy Foreign Minister Danny Ayalon on Israel's Channel 2 TV said there was no advance intelligence on an attack in Bulgaria. But counterterrorism expert Boaz Ganor cited the arrest of a Hezbollah operative in Cyprus in recent days who was suspected of preparing a similar attack. "This is probably a parallel operation and likely not the last in a series," he said. "All this looks like Hezbollah, Iran or a combination of the two." Bulgaria, a majority Orthodox Christian country of 7.3 million that borders Greece and Turkey, is a favorite tourist destination for Israelis. In recent years, Burgas has become popular as an inexpensive haven for groups of Israeli teenagers taking trips after finishing high school and before their military service.